We take your privacy seriously and treat all the personal data you give us with great care. We process personal data about you that you give to us when you make a donation, make a purchase, register through our website, sign up to our newsletter, sign up as a member, or book events from our site. This includes information such as your name, billing and delivery addresses, email address, telephone number and payment card details. When you visit our website we also automatically receive your IP address which is a unique identifier for your computer or other device you are using to access our site. We do not store your credit or debit card details at all, following the completion of your transaction. All card details and validation codes are securely destroyed once the payment or donation has been processed. When someone visits ulsterarchitecturalheritage.org.uk we collect standard internet log information and details of visitor behaviour patterns in order to provide the best experience we can for users and keep the site up to date and relevant. We will not associate any data gathered from this site with any personal data from any source. We collect information from or about the computers, phones, or other devices where you access our websites. We may associate the information we collect from your different devices, which helps us provide a consistent user experience. You can read more about how we use and apply cookies below. Distribution of our e-newsletter and updates. Personal data provided to us will be used for the purposes outlined at the time of collection or registration in accordance with the preferences you express. If you are a member of UAH this will include sending you confirmation of your subscription, membership materials, an annual review, regular e-newsletters from which you may unsubscribe at any time, and details of our events and offers. We process your data for fundraising and marketing purposes to ensure that we are contacting you with the most appropriate communication, which is relevant and timely and will ultimately provide you with an improved experience. In doing so, we may use profiling techniques using publicly available data or information that you have already provided to us. This helps us to make appropriate requests to donors who may have the means and the desire to give more. Importantly, it enables us to raise more funds in a cost-effective way. You can opt out of your data being used in this way at any time by contacting us on 02890 550 213, [email protected] or by writing to us at Old Museum Building, 7 College Square North, Belfast, BT1 6AR. If you are enquiring or looking for advice, we will consider that you are interested in hearing from us and therefore may, from time to time, send you information that is of relevance to your request. If you are registering with Directory of Traditional Building Skills, we will require your contact details so we can get in touch with you regarding your contacts details and updates to the Directory. We will also use your details in the future to ask whether you require any further services or to ask for your feedback on the service you have received. If you are entering Heritage Angel Awards, we will need your contact details so that we can be in touch via telephone, mail and/or email to administrate and manage your application or nomination. We will also use your details to inform you of other relevant regional events and workshops, awards and competitions. We may also use your details to ask for your feedback. If you are contacting us regarding a building at risk (BHARNI), it is at your discretion whether to disclose your identity and/or contact details. If you do disclose your contact details it may be of use to share with relevant or interested parties. UAH will not share your contact details, unless we have the permission to do so. You may contact us at any time to ask us to remove your details by contacting [email protected]. Wherever possible and appropriate we will seek consent from a parent or guardian before collecting or using information about children or adults at risk. Receiving marketing information from UAH will always be your choice. You can change your mind at any time and we will keep your preferences up to date. 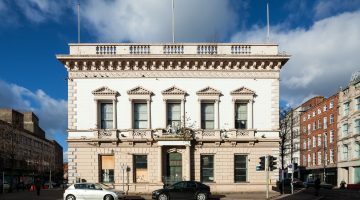 You can contact us on 02890 550 213, [email protected].uk or by writing to us at Old Museum Building, 7 College Square North, BT1 6AR, at any time to be removed from our lists. We do not make fundraising phone calls and would only telephone you if we had a specific query. Most of the data we process about you comes from you, for example, information you provide to us online. Some information comes from third parties such as our partners. Other information is gathered during your use of our website (e.g. IP addresses or information obtained via cookies). Do you have to provide your personal data? if you make a donation or pay for an event on our website, we need details such as your name and address and payment card details to be able to take your payment. If you do not provide your data we will not be able to process your payment;. you can turn off cookies on your browser and we will not place any cookies on your device or computer. However, this may mean that you may not be able to use all parts of our website. With contractors, agents and other third parties who provide services to us. If you use our website to make a donation or pay for an event details will be processed by World Pay on our behalf. If your membership is by direct debit your payments will be processed by Rapidata on our behalf. This includes your payment information, such as your credit or debit card number and other card information, and other account and authentication information, as well as billing, and contact details. We ensure that these suppliers abide by our data processing agreement. We will hold your personal information on our systems for as long as is necessary for the relevant activity for which your data was originally obtained. For example we will keep a record of donations or membership subscriptions for at least seven years. The nature of our work is such that we may have lifelong relationships with donors, beneficiaries and supporters. Legacy income is vital to the running of the charity. We may keep data you provide to us for a specified length of time, to carry out legacy administration and communicate effectively with the families of people leaving us legacies. This also enables us to identify and analyse the sources of legacy income we receive. UAH uses a third party service to help maintain the security and performance of the website and we may share information with this third party where necessary. You have several rights in relation to your personal data. These include accessing your data, correcting any mistakes, having your data erased, restricting the processing of your data, objecting to the processing of your data, data portability, and rights relating to automated decision making and profiling. In most cases there are conditions attached to these rights. Please see below for further information on each of these. You do not have to pay a fee for a copy of your information unless your request is unfounded, respective or excessive, in which case we will charge a reasonable amount in the circumstances. We will let you know of any charges before completing your request. We aim to respond to you within 1 month of receiving your request unless it is particularly complicated or you have made several requests, in which case we aim to respond within 3 months. We will let you know if we are going to take longer than 1 month in dealing with your request. If we have a lot of information about you we might ask you if you can tell us what exactly you want to receive. This will help us action your request more quickly. You can ask us to correct any data which is inaccurate or incomplete. This is free of charge. If we have shared the data with anyone else, we will tell them about the correction wherever possible. We aim to deal with requests for correction within 1 month, although it might take us up to 3 months if your request is particularly complicated. If we can’t action a request to correct your data, we will let you know and explain why this is. There are some exceptions to this right. If one of these applies, we do not have to delete the data. for the purposes of scientific/historical research and statistics. You can require us to stop using your data for direct marketing purposes. We will stop as soon as we receive your request. There are no exemptions or reasons for us to refuse. We will provide your data free of charge in a structured, commonly used and machine readable form. We aim to provide your data within 1 month of receiving your request unless it is particularly complicated or you have made several requests, in which case we aim to respond within 3 months. If we are going to take longer than 1 month we will let you know and explain why we need more time. If we consider that we cannot provide you with your data, we will contact you and explain why this is. You have the right not to be subject to a decision which is based on automated processing and which produces a legal (or similarly significant) effect on you. If you are unhappy about how we are processing your data or how we have responded to a request or complaint, you have the right to make a complaint to the UK’s data protection regulator, the Information Commissioner’s Office (ICO). You can find more details about how to contact the ICO on their website https://ico.org.uk/.We may change or update this policy from time to time so please check this page periodically. This site offers payment facilities and some cookies are essential to ensure that your order is remembered between pages so that we can process it properly. This site uses Google Analytics, a widespread and trusted web analytic program. It helps us to understand how you use the site, and ways that we can improve your experience. These cookies may track things such as how long you spend on the site and the pages that you visit so we can continue to produce engaging content. For more information on Google Analytics cookies, see the official Google Analytics page. Some of the content on our site may be provided by third parties. This includes but is not limited to: Google Maps for interactive mapping, YouTube or Vimeo for hosted video and Flickr for images. When you visit a page containing content from one of these sites a cookie may be set. We do not have any control over these cookies and you should check the relevant third party website for more information about these. If there is something that you are unsure about, it is usually safer to leave cookies enabled in case it does interact with one of the features you use on our site.